For Danbury camper van owners, or potential owners, in the South of England, there’s really only one choice for quality, professionalism and passion: VW Kampers Ltd. Here, at VW Kampers, our business has expanded from some very humble beginnings. A small collective of VW Danbury camper van lovers, we were one of many unsatisfied UK drivers who were frequently searching for a reliable, professional service targeted solely at our demographic. The only way of fixing this issue, that we could see, was to go into business for ourselves, and offer these services across Southern England. Even today, you can see this same theme of passionate and down to earth service with our family run company model and dedicated staff. From a tiny, hope-filled business, into the South’s most popular used Danbury retailer and garage – we’ve created a reputation to be proud of. This reputation is because we promise to always give the best, fairest price on all used VW Danbury motor home stock, and when buying any retro camper vans from customers, for resale. We believe a balanced and mutually beneficial relationship is the only way for a company to progress, and we stand by that belief. 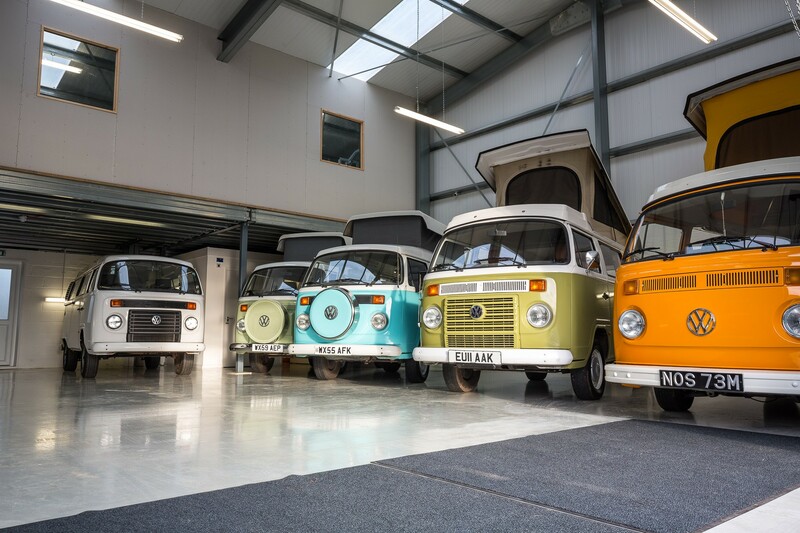 When you come to us for your VW Danbury and VW T2 camper van needs you’re not just dealing with another second hand car lot – you’re dealing with a team of staff who live and breathe these beautiful retro camper van motor homes, every day of their life. That being said, we recognised, in our early days, that it wasn’t just a resale or second hand retailer that was missing from England’s used Danbury camper world. There was also no sign of a professional and dedicated garage for maintenance, repairs and other services. Complete vehicle service, with all professional and industry standard examinations for all ages of Danbury campers. Professional roof conversions including ‘pop top’ conversions for the iconic Danbury motor home style. Power steering installation to bring the older motor home into the 21st century (we offer a courtesy car for all customers during this fitting). A whole wealth of interior work, including our hugely popular re-upholstery, new interior colour-ways, and 4 berth conversions. Complete body re-sprays or touch-ups for to inject a bit of life back into some faded paint jobs. Much, much more when you come to VW Kampers Ltd for all Danbury motor home issues. It’s a given that you always trust the word of your peers when it comes to the professionalism or quality of any service; which is why we’re happy to let out customers speak for us. Taking a look through our customer testimonials will show you a wealth of happy clients, such as Bob, Hayley, Toby and Scarlett who praised our attention to detail: ‘The attention in every nook and cranny of our camper is second to none… I feel very proud letting people look around the camper and telling them where it’s from’. You could be in the same situation as these happy campers, too. What’s stopping you? If you’re looking for a cheap, affordable and quality used VW Danbury campervan for your own, or simply need some repairs or services for your Danbury retro motor home, then don’t hesitate to get in touch with us, today! Additionally, if you’re looking to sell of your old vw Danbury camper, then check out our ‘Want to Sell’ page for a few application forms to get things started.